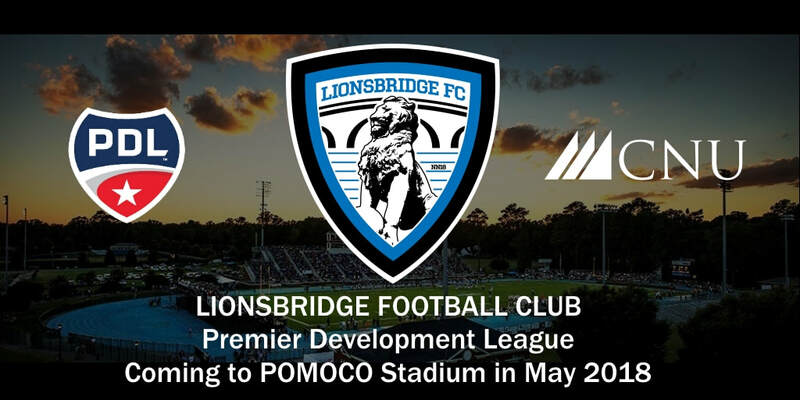 An exciting new chapter of Peninsula history began November 14, 2017 with the official formation of Lionsbridge Football Club, the announcement of its home stadium, league affiliation and Founding Members campaign launch. Constructed in 2001 on the campus of NCAA Division III powerhouse Christopher Newport University, POMOCO Stadium features a pristine natural grass surface, a high definition video board and a capacity of 4,200. Each Lionsbridge FC home event will be preceded by a two-hour pre-game community festival complete with a beer tent, food trucks, bounce houses, live music and family entertainment. The team will begin play in May 2018 as the newest member of the Premier Development League, the top amateur soccer league in North America. The PDL consists of 70+ teams across the U.S. and Canada, functioning as Major League Soccer’s primary developmental and player showcase platform. Nearly 70% of all MLS SuperDraft selections since 2010 have PDL experience, including a total of 59 alums chosen in 2017. Hundreds of professional players have gained PDL experience prior to the pro debut, including Newcastle United FC defender DeAndre Yedlin, 2016 MLS Rookie of the Year Jordan Morris, 2017 MLS Defender of the Year Ike Opara, Atlanta United captain Michael Parkhurst, and current U.S. Men’s National Team members Darlington Nagbe, Brad Guzan and Geoff Cameron. The Lionsbridge FC Founding Members drive kicks off today and continues until December 24. Founding Members will receive exclusive, one-of-a-kind benefits and discounts for helping establish the club on the Peninsula, including a 2018 Season Ticket Jersey. Fans wearing the Season Ticket Jersey to all home Lionsbridge FC events, including postseason, will bypass the POMOCO Stadium ticket line. Plus, fans who register as Founding Members this week will also receive a FREE Founding Members Scarf (shipped to arrive Dec. 18). Season Ticket Jerseys will be distributed to Founding Members during the team’s Preseason Celebration Event in April. Lionsbridge FC’s PDL division assignment and league opponents will be finalized in December. The club’s 2018 PDL schedule is expected to be announced in February.